We distribute confidence in Fire Detection Systems. Legacy Communications is uniquely suited to your needs! We provide and service high quality and innovative fire protection equipment for multiple applications. Commercial and residential, as well as high-rise and new construction, can all benefit from our expertise and technological prowess. Installing and servicing fire systems often poses unique challenges. Rely on us – an independent distributor with years of experience in the fire alarm industry. Legacy Communications stands for quality and service, and we are proud to pass this expertise and dedication on to you! 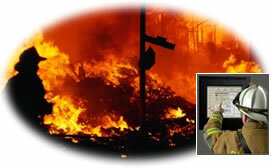 We are your local one-stop resource for fire systems. With our industry knowledge, we can assist you in making the best decisions for your business. We are committed to providing you top-notch customer service, in addition to a quality, reliable system that is the most cost-effective over the long term. Overhead Voice (see Paging Systems). CADgraphics will help you save time, money and property, but most importantly, it will save lives. It tracks the status of every alarm and device in your fire and security system, as well as your building control equipment. Real-time information is displayed about your building on maps, floor plans, and color-coded lists, along with custom “Take Action” messages. CADgraphics can combine data from any number of devices, from any manufacturer, and automatically recognizes new devices and updates itself. It is user-friendly and operates like standard Windows software, and can be accessed from remote locations. An important feature of CADgraphics is that it is easy to reconstruct emergency events after the fact as it compiles exacting reports of alarms and events as they occurred, which you can print and distribute quickly and easily.